This fun filled family event comes around in February in Jacksonville to thrill thousands of moms dads and kids annually. This was Bryan's first time to see Monster Jam, and these famous monster trucks up close. He has a collection of them, but seeing them in person gives you a whole new perspective of coolness. Thousands of people were tailgating in the parking lot, with lawn chairs, footballs, skateboards, cooking hamburgers and hot dogs on portable gas grills, and having a great pre-show party. 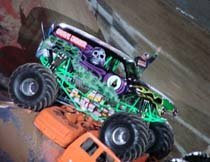 Once in the stadium, we were amazed at the sheer size of it, and the amount of happy monster truck fans that filled the venue. Bryan screamed loud at the top of his lungs, while his favorite Gravedigger launched over the ramp and into the air. The crowd went wild! He laughed and was mesmerized by the demolition derby at half time, when the funny cars with trailers, were crashing into each other trying to knock the trailers off each other. This is a great family event that I would recommend for a fun filled adventurous day!